“Now, you stay with the car, dear, and do stop mumbling. I’m not listening to you, but people passing by will want to hear you speaking up brightly as if you had something interesting to say. I’ll just be a few minutes in the bookstore; then you can drive me to the dry cleaners, grocery, and to my sister’s house for lunch. 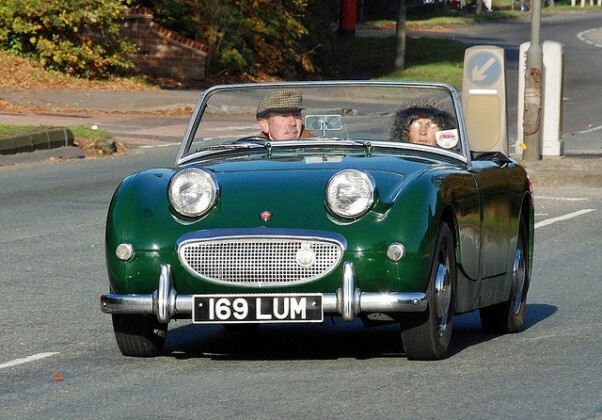 Already seated rigidly upright and braced in the family’s Austin Healey Sprite, Fred Stoth felt mildly irritated with his wife Linda’s caustically flippant remarks. Wasn’t it enough, he wondered, to endure the cramped quarters of an automobile she had insisted they buy because it presumably lent an air of style and sophistication to their lives? Not that he would voice such sentiments, for when had his opinion ever mattered in the face of his wife’s love of notoriety? Better to find solace in more immediate elements within his control, something not unlike civil disobedience. But now, his attention was drawn to what appeared to be a brawl taking place in an alley between Barney’s pub and Fannie Mae’s Dress Shoppe. Fred could hear abusive language, and he could see four young men squaring off to do battle. Already a throng of people were gathered. It was simply impossible to see what was happening from where he sat, so Fred got out and began walking toward the melee. The noise grew as he approached, and he could soon distinguish the name calling and the epithets being hurled by the young men who danced about one another threatening violence and mayhem. Fred was surprised that no one from the gathered crowd moved to stop the thing before blows could be exchanged. It was as if people had paid for ring-side seating at a main event where blood would soon mix with sweat-scented saliva before someone was carted away. Fred wondered. “The whole thing had to have been staged, but why?” Suddenly, sirens began going off in his head, and he looked back where he had parked the Austin-Healey. It was gone! Laughing lightly, Fred retraced his steps to the spot where he’d parked and took a seat on the curb. “Those scamps have taken it again. And for the gazillionth time!” he thought. Linda would have scathing words for him when she returned, and she would have dire things to say about young people, but there was a rather delicious irony to the situation, and he felt a conspiratorial gladness come over him. “Where would the pack of happy young pranksters leave the Austin this time?” he asked himself. “It wouldn’t be on a raft lodged against a boulder in the middle of Oak Creek; they’ve done that already. And, it won’t be found dangling from a sycamore tree by a steel cable tied around the back axel! Nor would they be tempted to carry the tiny car into the lobby of the women’s dormitory on the Doodlebug University campus. Once was enough.” Philosophically, Fred surmised that the car may very well have been carried by stalwart young miscreants as much as it had traveled under its own power, and he smiled remembering the time they picked it up and left it straddling a stout chain where it remained for a week before being picked up again and hauled into the student union where it was briefly used as a storage locker. So engrossed was he in reliving the adventure of owning a vehicle whose miniscule proportions made it a target of merriment, Fred wasn’t aware of the small parade approaching him until it was upon him. It was then he saw the smiling faces of many young people he knew, and watched as the group parted to reveal the Austin, carried by eight burly college men who carefully placed it in the exact spot from which it went missing twenty minutes before. When Linda returned, she found Fred as she’d left him, shoe-horned behind the steering wheel but with an enigmatic smile of complicity tugging at the corners of his mouth—all that remained of shared laughter and an ever-so-slight rebellion.